The Civil War was the most deadly war in US History. The short lived Confederate States of America (Now known as "The South"), were outnumbered and out gunned. Sometimes they needed to think outside of the box. 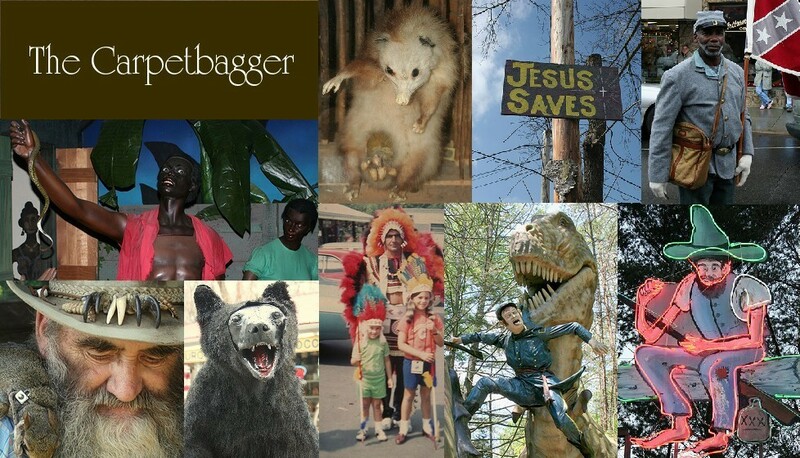 Here are three of the most notorious examples. During the Civil War, all young able bodied men were required to fight. Back on the homefront, those that were elderly or disabled would have to find other ways to help in the Lost Cause. The old men of Athens, GA decided that they would help by by creating a secret weapon: The deadly Double Barrelled Cannon. The point of having an extra barrel was to fire two cannonballs simultaneously. These cannon balls would be connect by a chain. The cannonballs were supposed to spin causing a whirling disk of death that would rip the heads off of Union Soldiers. Unfortunately for the old men of Athens, GA things did not go according to plan. It was really hard to get two wicks to burn at the exact same pace. The cannonballs would not fire at the same time. Instead, the balls would fly out haphazardly. The chain would break and send the cannonballs flying in random directions. A man was killed during the testing of the cannon. The canon did not revolutionize warfare and to this day it sits on the courthouse steps in Athens as a monument to how something that sounds awesome in practice can just be ridiculous and dangerous in practice. Inside the fantastic Museum of Appalachia there is a true treasure. This strange wheel-like contraption is a perpetual motion machine created by Civil War era inventor Asa Jackson. Asa worked in a cave in the backwoods of Tennessee. Asa allegedly created a working perpetual motion machine: a device that is self propelled without using outside power that can run forever without any additional power. Now, some "physicists" may say that this is simply impossible, but who are we to question Asa? It looks legit to me. Asa was paranoid about his idea being stolen and would partially disassemble his machine before he left the cave. Sadly, Asa would die before he ever got around to explaining to anyone how to put it back together or how it worked. No one has been able to get it cranked ever since. 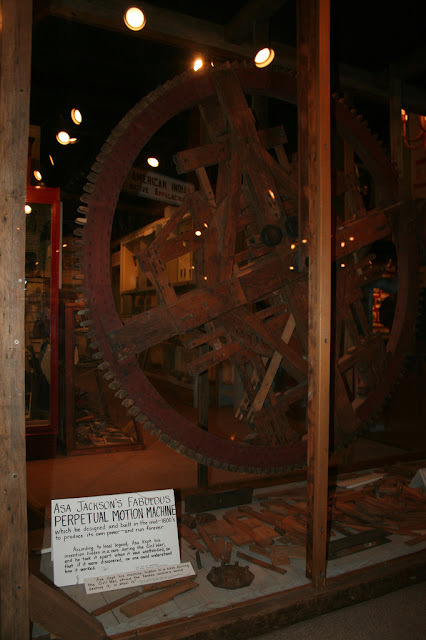 Now, no one knows for sure what the practical applications would have been for Asa's machine, but having an infinite source of power would have served the Confederate army well. My guess is that Asa was terrified that Union raiders would take his device. Now the machine sits at the Museum with a pile of odd wooden odds and ends. The Museum Welcomes suggestions on how they may get the machine to work. 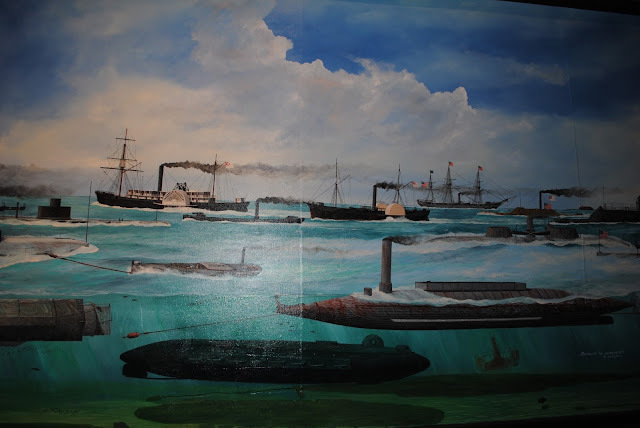 Before visiting the Civil War Naval Museum in Columbus, GA I had no idea that there were any Naval battles in the civil war. It doesn't seem to make much sense, since both sides shared the same unbroken landmass, but there were actually lots of naval battles and the ships looked like something out of a Steampunk novel. But the craziest and most insane of these devices was the CSS H.L. Hunley. The official claim to fame of the Hunley is that it is "the first submarine to sink a ship." But of course this was the 1860s, so that was easier said than done. See that little thing? That's the Hunley. First of all it required eight men to pilot. Notice how small it is compared to the guy standing next to it. It was a claustrophobic nightmare. 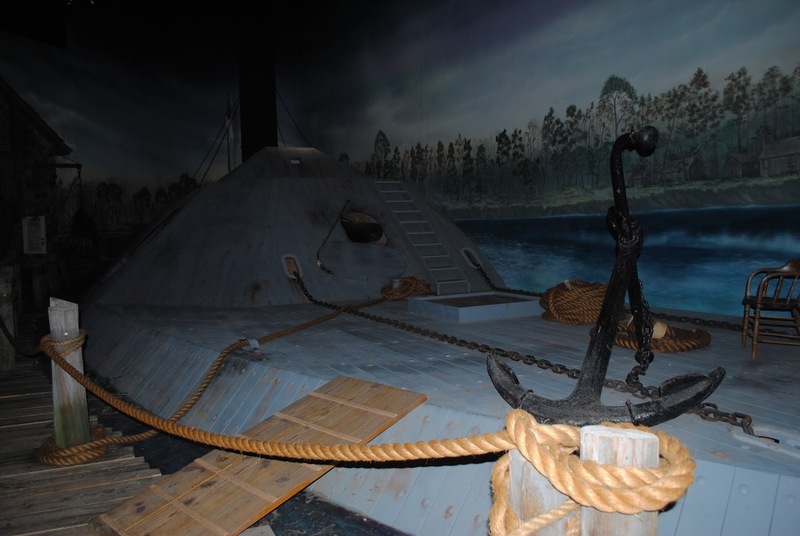 Worst of all, the Hunley was entirely hand powered. Meaning that the only thing the made the propellor turn was the 7 guys turing the big crank on the inside. 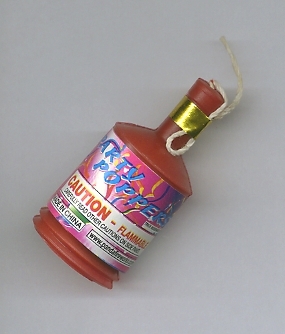 So how was this crazy thing supposed to actually kill people? It had a giant spear mounted on the front. You just and to ram in into something. One you jammed the spear into the ship, you swung the Hunley into revere and pulled away from the spear. This action would detonate the gunpowder filled bomb on the end of the spear. Just like a party popper. 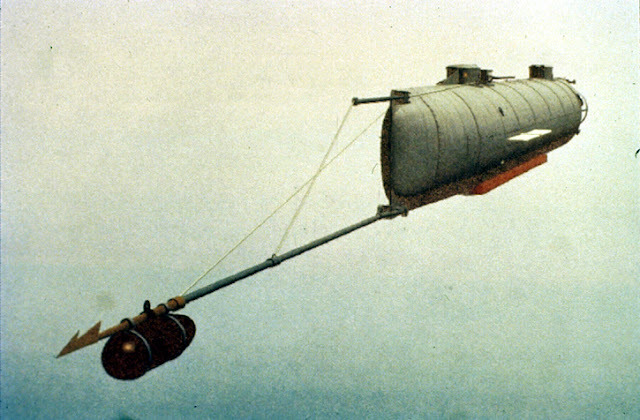 The developmental process of the Hunley was grim. During two separate test voyages the ship would sink, killing the crew, including its inventor H.L. Hunley. 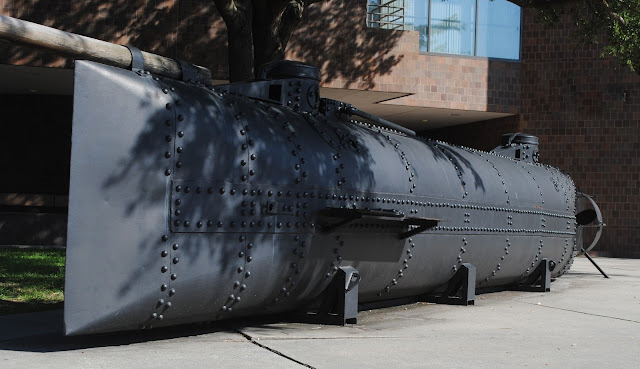 Despite this, the confederate army would give the Hunley a thumbs up and sent it into battle in the Harbor of Charleston, SC. Shockingly things went according to plan and the Hunley was able to spear and explode a real Union Battleship. Things went awry somehow and the Hunley never returned to port. No one knows exactly how the crew died, but its likely that they simply ran out of oxygen. The Hunley would sit in at the bottom of Charleston Harbor until the 1990s when it was pulled out of the briny deep. 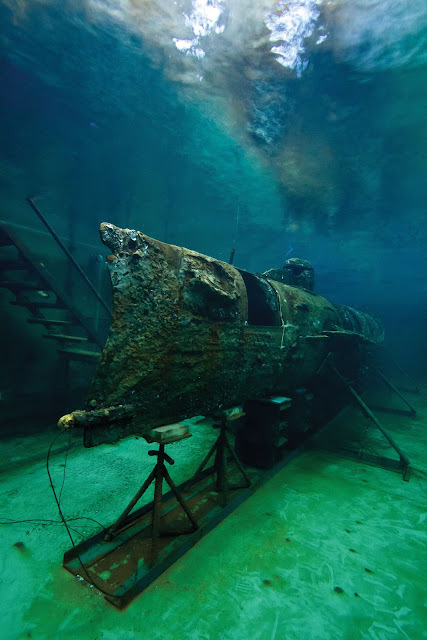 You can actually visit the Hunley on weekends. It is kept in a weird chemical bath that preserves it like Vladamir Lenin.